A state commission's move to eliminate Missouri's matching low-income housing tax credit program, if sustained, will kill an $80 million apartment project that was on the verge of being announced in Kansas City's downtown freeway loop, a local developer specializing in affordable housing projects said Friday. According to Hrabe, he had been on the verge of announcing a partnership with the New Jersey-based Michaels Organization, one of the nation's largest affordable housing developers, that would have led to the purchase of an undisclosed downtown site, where the partners planned to build a mixed-income project including 400 apartment units. I'm guessing this would have been in the East Village area? Nope. Was planned for another area. Heard developer is changing gears and will try to use city incentives to build in the East Village. Developer Kelley Hrabe is scrambling to salvage his plan to build 400 affordable apartments downtown following a sudden shift in state policy and plans to pitch his project for the long-dormant East Village redevelopment area. Hrabe of Prairie Fire Development was about to announce his residential project at another downtown location when Gov. Greitens abruptly jeopardized the deal by announcing Nov. 17 he was cutting the low-income tax credit program from the budget. The developer said the state low-income tax credits were vital to financing the project he envisioned for an undisclosed site within the downtown Loop. Ordinance introduced to transfer this property to LCRA to "facilitate redevelopment within the Grand Avenue Office Campus Urban Renewal Area". It could mean something is brewing or it could just be checking off an administrative to-do list. Isn’t this the same site as the twisty tower? atticus23 wrote: Isn’t this the same site as the twisty tower? yep, the twisty tower is gone, you should have known that KC would not get anything unique or innovative built here. It's still an option but it needs a tenant. KCPowercat wrote: It's still an option but it needs a tenant. Detroit is building an 800' tower without any tenant. moderne wrote: Detroit is building an 800' tower without any tenant. He added: “If everything we did in Detroit over the past seven years was dictated by lenders, we never would have gotten going. We’re trying to take this market to the next level — that means that we can’t be at the mercy of conservative lenders." Nick Abnos indicates he hopes to sell the Firestone Building and Romanelli Shops to finance the renovation of his property at 10th and Oak (formerly called the Insurance Building) into a boutique hotel. I'd prefer Abnos just sell all his buildings, and the best thing that could happen to the 10th and Oak building is for the ownership of the East 9 at Pickwick Plaza development to buy it and do the renovation and management. He may have better luck with the value of the Romanelli shops on Gregory. That Egyptian mausoleum next door to the Oak bldng would make a cool townhouse. 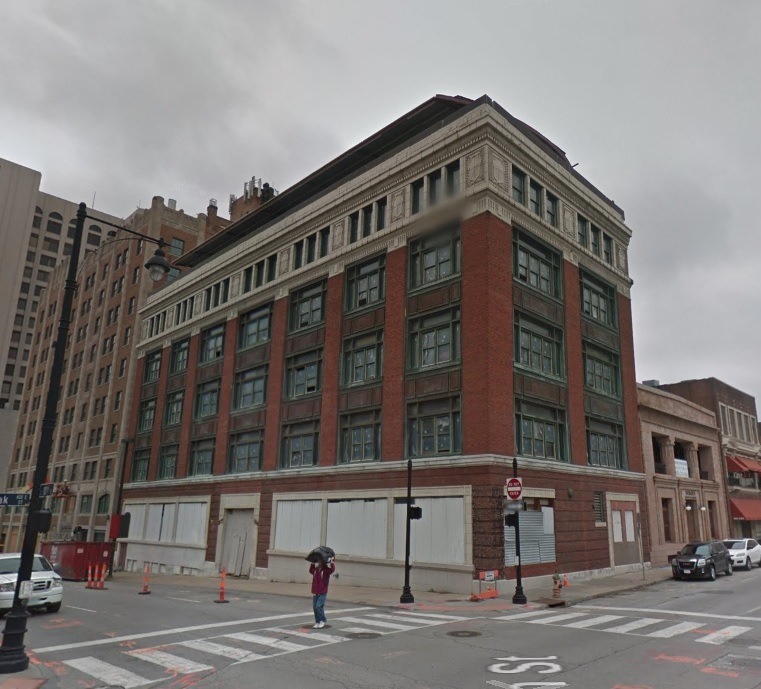 FangKC wrote: Nick Abnos indicates he hopes to sell the Firestone Building and Romanelli Shops to finance the renovation of his property at 10th and Oak (formerly called the Insurance Building) into a boutique hotel. I find this building to be very handsome. I like the mix of materials; would make great loft space. Anyone know the market rate value for this property?